Berries of our native pokeweed are food for more than 30 kinds of birds in the fall. These berries were a staple food of the now-extinct passenger pigeon. Pokeweed is toxic to humans and livestock, although the plant has been used as food and medicine in the past. From a bird’s point of view, fall is a season of seeds and berries. One very popular source of berries is a large and gangly native plant known as pokeweed. Pokeweed (Phytolacca americana) probably doesn’t look like a candidate for your wildflower garden. It grows 4-10 feet tall, with a coarse, reddish stem, spreading branches, and large leaves. The plant also may have an odor, which some people consider unpleasant but others describe as earthy. In early summer it bears spikes of small, white-green flowers that you might not even notice, but in the fall its showy clusters of purple-black berries make a luscious treat for birds. At least 30 different birds feed on the berries. They include mourning doves, bluebirds, robins, mockingbirds, and cedar waxwings, all of which commonly eat fruit. Flickers, red-bellied woodpeckers, phoebes, kingbirds, catbirds, cardinals, rose-breasted grosbeaks, and white-throated sparrows also feast on these berries. Migrating birds stop and fuel up on them. Pigeonberry is an old name for pokeweed. The name comes not from the pigeons that people try to chase off their buildings in the center of Westborough these days, which are also known as rock doves (Columba livia). Instead, the name comes from the passenger pigeon (Ectopistes migratorius). Pokeweed berries were known as one of the staple foods of this native North American bird. Unfortunately, passenger pigeons have been extinct for about a century. The last one died in a zoo in 1914. The passenger pigeon’s story is a sad tale. Huge numbers of passenger pigeons were here when European settlers first came to North America. Passenger pigeons were once believed to be the most abundant bird in the world, numbering more than a billion. As settlers moved westward, they cut down forests of beech trees, which supplied beech nuts, another staple food of passenger pigeons. Overhunting then brought the passenger pigeon to extinction. Professional hunters killed and sent vast numbers of passenger pigeons to market, especially from the 1820s to the 1870s. By 1900, passenger pigeons had disappeared from the wild. Then as now, birds spread pokeweed seeds in their droppings. Look for pokeweed near places where birds tend to sit – along fences and power lines and near shrubs. Pokeweed is also common in edge areas, where fields or lawn or other open land meet woodlands. Pokeweed spreads only by seed, and its seeds can last 40 years or more in the soil. They are more likely to sprout and grow when they land at some distance from the parent plant, rather than nearby. The reason? The roots of pokeweed produce chemicals that discourage its own seeds from germinating. The chemicals may affect seeds of other plants as well. Because of this chemical defense against the plant’s own offspring, those berry-eating birds do the plant a real service by spreading its seeds far and wide. Other wild animals also consume pokeweed berries. They include white-footed mice, gray and red squirrels, raccoons, opossums, and even black bears. Pokeweed can be toxic to humans, as well as to livestock such as horses, cattle, sheep, and pigs. The root and the seeds are especially toxic, but the berries and leaves can be toxic as well. The juice of the plant can also cause a skin rash. As with many native plants, toxic qualities did not prevent people of the past from putting pokeweed to many uses – as food, medicine, dye, and ink. The difference between “toxic” and “useful” typically lay in the way the plant was processed – what people did to it before using it – and in the dosage or amount used. One widespread use in the past, and even today among some people, was to collect the young shoots of this perennial plant in the spring, cook them for half an hour in two changes of water, and eat them like asparagus. Part of the secret of using the shoots was to avoid using any part of the root or any sprouts showing traces of red. Around the time of the American Revolution, pokeweed was introduced to Europe to be grown as food, although it may not have caught on for very long. The plant now grows wild in southern Europe and northern Africa. Native Americans used the purple berry juice to dye clothing and make paint, and settlers used it as ink. The name “poke” is related to a Native American word for red or yellow dye. 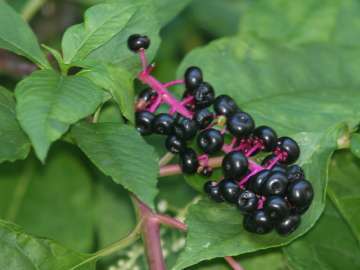 Along with some other plants, pokeweed was sometimes also called inkberry. One drawback, however, was that the color fades quite rapidly. Native Americans of the past often suffered from rheumatism because they were constantly outdoors and exposed to the weather. To treat rheumatism, some tribes drank a pokeberry tea or applied the root in a warm moist wrap. Colonists picked up these and similar uses from them. Pokeweed was also applied to treat pimples and blackheads. Dairy farmers used an extract of dried roots and berries to soothe cows’ udders. If you spot pokeweed growing along an edge area on your property, consider leaving it there to attract birds. And let it remind you of the long-gone passenger pigeon.